The Samsung S5050 is a new addition to the family of Samsung S series. This stunning new cell phone from Samsung Electronics comes with next generation features and superior technology. The Samsung S5050 features a 2.2 inches AMOLED display screen with 256k colors and resolution of 240 x 320 pixels. 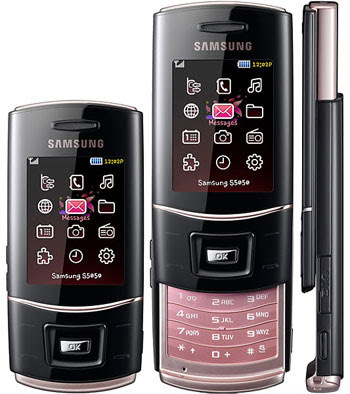 This amazing slide phone comes with stylish sleek body with blending black and light metallic pink color combination. The phone is also available in various other attractive color combination. This unique phone features WAP 2.0/xHTML, HTML (Net Front 3.5) Browsers for speedy surfing. With the quick navigation feature the users can access their messages, emails with a press of single button. Samsung S5050 comes with slim portable body which weighs only 102 grams with dimensions as 105 x 49 x 14.9 mm. The phone is priced at around 180 Euros approx.